Osteoporosis affects roughly 40 million Americans either because they have been diagnosed with the condition or they are at risk for developing the condition. Osteoporosis means “porous bone”. Osteoporosis is a serious condition in which the bones have decreased in density, causing them to become weak and fragile. The disease is the result of lower than average amounts of phosphate and calcium in the bones, which causes them to become porous and brittle. 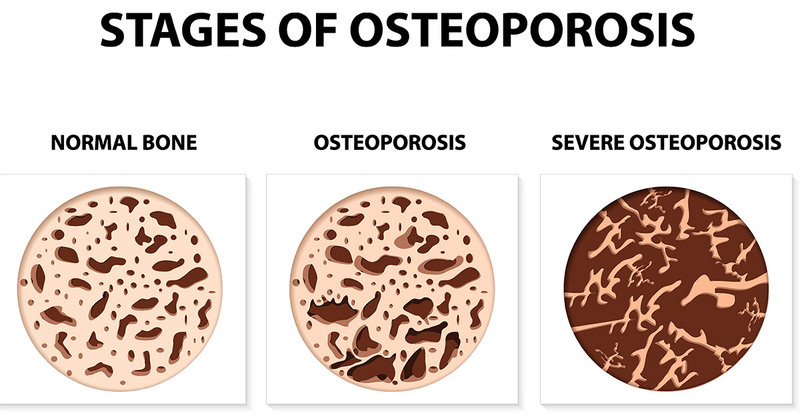 Osteoporotic bones break much more easily than healthy bones. Our bodies are constantly absorbing and rebuilding bone. This is normal and necessary, but if the body absorbs bone more quickly than it rebuilds it, we will develop osteoporosis. Bones that most commonly break are the bones in the spine, wrist and hip. At Spine Nevada we offer comprehensive care, including a review of medical history and evaluation of laboratory tests. We will discuss conservative and preventive measures, nutrition & lifestyle modifications, and medication treatments if necessary, to improve or maintain bone quality. At SpineNevada, we work with you through exercise, physical therapy, nutrition and medications to treat and reverse osteoporosis. We will also develop a customized plan for you to prevent and treat osteoporotic fractures. A bone density test (DEXA Scan) measures the mineral content of bone, and is used along with a risk assessment to diagnose osteoporosis. Fragility fractures, such as a broken hip from a ground level fall, also determine osteoporosis. Loss of height due to a compression fracture in the spine is another indication of osteoporosis. GOOD NEWS: Proper nutrition, weight bearing exercises and specific medications can all help the body rebuild bone. There are both controllable and uncontrollable risk factors that increase or decrease odds of developing the disease. For instance, people of all ages, races and genders get osteoporosis, but it is a condition most commonly found in Caucasian and Asian females over the age of 60. Other uncontrollable risk factors include: family history, certain diseases and hormone levels. HOW CAN I AVOID DEVELOPING OSTEOPOROSIS? Controllable factors encompass those things that an individual can do during their lifetimes to lower their risk for developing osteoporosis. For instance, smoking, excessive drinking (more than 7 ounces of alcohol per week), poor nutrition with low calcium intake and lack of exercise can all contribute to the development of the disease. The far right column provides educational information on mineral consumption. The best treatment for the disease is prevention by consuming the recommended amounts of calcium and phosphate throughout a lifetime. Essential vitamins and minerals for bone health are calcium, magnesium, and vitamin D. Hormone treatments may help and an exercise regimen is recommended to abate further deterioration of the bone. To find out if you have osteoporosis, an energy X-ray absorptiometer (DEXA) scanning can analyze bone density. Medications for osteoporosis include oral medications such as alendronate and Boniva, an annual infusion (IV Reclast), a twice yearly subcutaneous injection (Prolia) or a once daily injection (Forteo). These medications help the body rebuild bone, and are highly effective in decreasing osteoporotic fractures. Osteoporosis causes over 750,000 Vertebral Compression Fractures each year in the US. Kyphoplasty is a minimally invasive spine procedure that offers patients with back pain almost immediate relief from painful vertebral compression fractures (VCF) caused by osteoporosis or cancer.